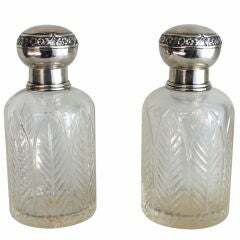 A pair of sterling silver necked, heavy cut crystal decanters that sit in a sterling silver locking Stand. This is an exceptional piece in both quality and design. 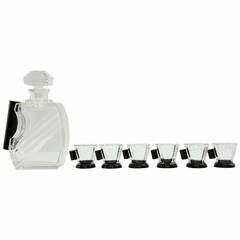 The thickness and quality of the cutting in the crystal decanters themselves is superb, but this is matched by the design and quality of the locking stand that they sit in. 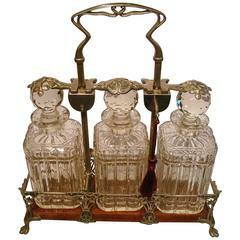 The idea of a locking decanter came about as more exotic and expensive spirits became available throughout developing households across the planet, the need to secure them from unwanted attention did also! 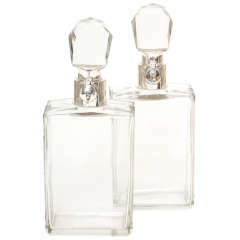 Bottles, for the most part were unattractive, and often not sealed particularly well. So, spirits that could be kept for longer, were decanted into more highly decorative and expensive vessels that were sealed tightly, and then displayed as a show of wealth and sophistication in the burgeoning middle and upper classes. This is an excellent example. This set is made by the American company; Hawkes. After immigrating from Ireland in 1862, landing in Brooklyn, he began working for Hoare and Dailey Cut Glass Firm. Upon learning the trade he decided to embark on his own venture, establishing Hawkes Rich Cut Glass, which then incorporated into T. G. Hawkes & Company in 1890. A year before incorporation the Hawkes company displayed its wares at the Universal Exposition, in Paris, where it won acclaim and a Grand Prize. 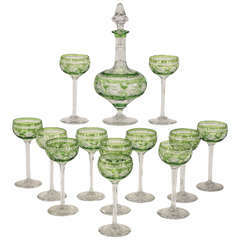 Hawkes went on to become the one of the leading names in glassware in America, if not the world. His glassware was a permanent fixture in the White House from 1885 until 1938, and adorned the American Embassy in Saint Petersburg, Russia. In the company's prime, in the early 1900s, they were at a staff of around four hundred employees, and were up to three locations. Corning, NY, wasnicknamed the "Crystal City". The sterling silver mounts andholders were also made by Hawkes, as they had taken this into the workshop by 1913, after usually outsourcing silver work to the likes of Gorham and Durgin. 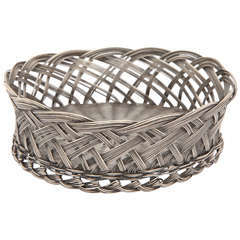 However, there are a number of pieces that were made for Tiffany & Co. and retailed by them using Hawkes glass. There is a flask on the website that is exactly the same type of cutting signed only Tiffany & Co., earlier than this, that would have more than likely also been made at the Hawkes factory. The design of the piece is superb. The two bottle stoppers are incorporated into the body of the frame, that once unlocked, and pulled up, turn to free and, at the same time, open the bottles. The bottles can then be removed from the frame. The condition of the entire set is superb. The frames and bottles are all signed Hawkes, and there is a product restoration number stamped into the base. A superb piece of American design history, produced in the 1920s. Art Deco crystal and sterling silver decanter. 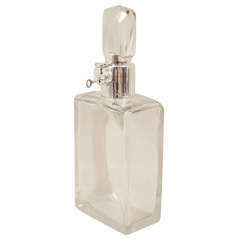 Elegant Baccarat hand-cut crystal decanter with stopper in what seems to be unused condition.